Five taxi associations in Benque Viejo Del Carmen are protesting a similar initiative by foreign, specifically Guatemalan nationals, to muscle in on their profits. The sixty drivers appeared in front of the Benque Town Council office this morning, asking the politicians to intervene in stopping Melchor vans and taxi drivers from making runs into Belize using Belizean taxi license plates obtained from transport authorities here. Using their Belizean plates, the Melchor drivers are bringing in students to attend school in Belize and making taxi runs – hurting the locals financially. According to our reports a meeting with the Council has been scheduled. this is terrible for our economy worst at this time where things are expensive for family survivor. I don’t know how can this institutions lack the ability to foresee the effects of doing something like this, giving Belizean plates to guats to ferry guats across when it should be given primarily to our Belizean taxi people. Worst being we have diplomatic issues with them. 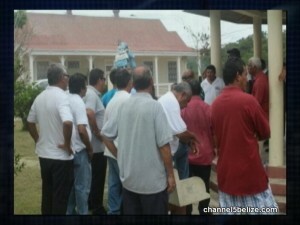 But due to corruption and love for money this people don’t give a sit about the effect it causes to us Belizeans. THAT IS A TIP OF THE ICEBURG !!!! THERE ARE 22 TAXIS OPERATING IN THE CAYO DISTRICT THAT ARE SURE GUATEMALAN NATIONALS. ASK THEM HOW THEY GOT DRIVING PERMITS & LICENSE FOR THEIR CARS. THOSE GUATEMALAN TAXIS HAVE TAKEN AWAY THE JOBS FROM THE TAXI DRIVERS FROM CAYO. AND…AND THE GUATEMALAN TAXI DRIVERS DRIVE VERY CRAZY, ENTER ANY NO ENTRY AT ANY TIME, SO PEOPLE BE CAREFUL WHEN WALKING THE STREETS OF CAYO DISTRICT. I ALMOST FORGOT “THE BEST IS YET TO COME” …YET TO COME, SO PREPARE TO LIVE MISERABLE OR GET USED TO SEE GUATEMALA TAKE AWAY OUR JOBS !!! Pressure on the incompetent puppet mayor. The area rep. Erwin Contreras (guatemalan by family, culture, and creed) has caused all this and much more since he became minister. He always looks to satisfy his guatemalan paisanos and get their votes, and have his fellow Belizeans eating from his hand. Those same taxi drivers were supporting him in his campaigns. Now he is giving them bukkut!!! Indeed, and I would say that many of other labor aspects have been affected by not only Guatemalans but also many other Central American foreigners who would do a job for a better price than Belizeans and sadly many employers would accept their prices for a certain job leaving Belizeans with no other option than to work for the same price as foreigners. though I understand and have seen the effects of that in the far western part of the country where at first the minimum for a yard lot chopping and cleaning would range from $35 to $60 depending on conditions and size but now it ranges from $25 to $35 which was and is affected mostly by Guatemalan who’s economy is very bad and a $20-$25 Belizeans Dollars a day is equivalent to Q60-Q75. Imagine they would would chop a minimum of 2 lot yards a day for $25 which would be $50 equivalent to Q150. Sadly impacting our local laborers.